V.2755 - Captivating & pristine villa! 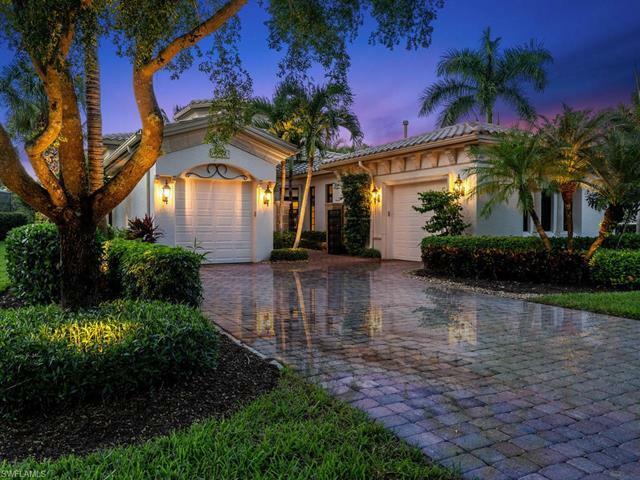 A paver driveway & gated courtyard entry w/lush landscaping & water fountain sets the stage for this impressive 3 Bedroom, 3.5 Bath +Den residence situated on a lakefront lot. Step into the stunningly bright foyer, open doorways and neutral ceramic tile on the diagonal w/decorative inlays. Separate living & dining rooms featuring volume ceilings w/crown moldings, recessed lighting, and windows with arched transoms. Entertain guests in the Family Room while creating culinary meals in the open kitchen w/Butlerâs Pantry. Retreat to the Ownerâs Suite w/custom walk-in closets, wood floors, and private lanai access, luxurious En-suite w/dual sinks, soaking tub and walk-in shower. Generously sized guest accommodations w/en-suites. Sliding glass doors bring the outdoors in with screened lanai w/seamless screens, electric sun screens, outdoor kitchen, gas fireplace, pool & spa w/rock waterfall. Stunning sunset views over the lake and dedicated preserve. Split 2-car garage accessible from Den & Guest Bedroom hallway. Located in a private villa enclave where living the dream becomes a reality!